As the result of Do Not Call (DNC) litigation brought by the U.S. Department of Justice on behalf of the Federal Trade Commission, as well as the states of California, Illinois, North Carolina, and Ohio, a federal court in Illinois has ordered penalties totaling $280 million and strong injunctive relief against Englewood, Colorado-based satellite television provider Dish Network. 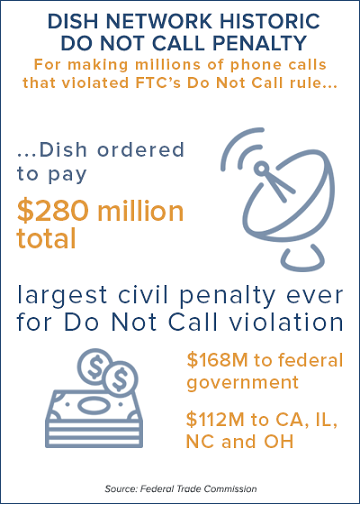 The U.S. District Court for the Central District of Illinois found Dish liable for millions of calls that violated the FTC’s Telemarketing Sales Rule (TSR) -- including DNC, entity-specific, and abandoned-call violations -- the Telephone Consumer Protection Act (TCPA), and state law. The civil penalty award includes $168 million for the federal government, which is a record in a DNC case. The remainder of the civil penalty was awarded to the states. The $168 million judgment is the largest civil penalty ever obtained for a violation of the FTC Act. According to court filings, Dish authorized Order Entry Retailers to market Dish Network programming nationally Dish would then complete the sale provide for the delivery and installation of the satellite dish and related equipment, and provide the programming. Provision I requires Dish to demonstrate that Dish and its Primary Retailers (those with greater than 600 activations or who use an Automatic Telephone Dialing System) are fully complying with the Safe Harbor Provisions of the TSR and have made no pre-recorded calls at any time during the five years immediately preceding the effective date of the order. If Dish fails to prove that it meets this requirement, it will be barred from conducting any outbound telemarketing for two years, and if Dish fails to prove that the Primary Retailers meet this requirement, Dish shall be barred from accepting orders from such Primary Retailer for two years. Provision II requires Dish to hire a telemarketing-compliance expert to prepare a plan to ensure that Primary Retailers and Dish shall continue to comply with the telemarketing laws and the injunction. Provision III allows the plaintiffs to make ex parte application for court approval of unannounced inspections of any Dish or Primary Retailer facility or records. It also requires Dish to retain and transmit to the plaintiffs on a semi-annual basis telemarketing compliance materials, including all outbound telemarketing call records. Provision IV prohibits Dish, whether acting directly or indirectly through Authorized Telemarketers or Retailers, from violating the TSR. The FTC recognizes and thanks the Department of Justice for its tireless litigation of this case on behalf of the Commission, and also recognizes and thanks all of the state co-plaintiffs for their litigation and support during the case.